In 1999 I was coding up a seat-allocation program for The Gathering (as part of the Zepo project) that was coming up a few days later, the object was to get groups of people seated optimally, near their friends on about 4000 seats with no free seats, not an easy task, I'll have you know. 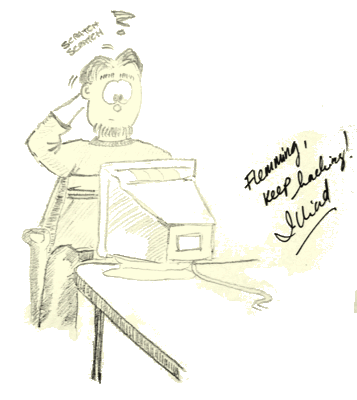 TG was also visited by Illiad of <http://UserFriendly.org> fame in 1999, waiting to go north to Hamar, he sat in Vegards living room and drew a few sketches, one of them was of me and he was kind enough to dedicate it, the dedication says: "Flemming, keep hacking, Illiad". I'm 33 years old and educated as datamatiker1. Since completing the education I've worked as a C++ developer on Windows, Perl/C++/C/Java developer on Linux/Solaris/Mac/Windows and other developer jobs. I've been selfemployed for two years, but I got tired of not having colleagues around, so I'm yet again an employee of Stibo Systems. Before getting my degree I taught at a local youth school, in using Internet and introductory programming, which was a lot of fun. Parallel to completing my education I've developed a large web-based administration system that later became the base for my own business. I'm generally interested in software development, but I take pride in writing elegant, maintainable solutions, so much so I get highly annoyed and almost depressed by defects that make the software inflexible (due to political or licensing considerations). I've worked with several operating systems, most of them posix compliant (unix-like); I've worked with windows for several years, after that 10 years with Linux, about 7 years of Solaris, 2 years of DEC unix and some AIX. I've developed many types of applications, from workstation based single-user programs using OpenGL or Swing as the output API to traditional client/server systems and webapplications. I've developed server-based webapplications in several languages for several webservers, but primarily Apache/Linux with mod_perl with PostgreSQL, SAP DB and MySQL backends. I've worked with several SQL databases, lately PostgreSQL and SAP DB on Linux, Oracle on Solaris, but also Microsoft SQL server, InterBase and Sybase on windows. I've worked with STL in C++ and I've developed and maintained servers written in C++ (running on both Solaris/windows) with Java clients (running on windows/MacOSX), so I'm quite comfortable with heterogeneous environments, Object Oriented designs, writing portable code and networking. I like having direct contact to the users and having a hand in every part of the development process, from capturing requirements to implementing and maintaining the deployed product, which I realize makes me an odd cross between a developer and an administrator. I've seen many systems in many languages and seen how bloat and complexity can hinder maintainance of the software so I've concluded that the best code is the code not written and that a simple system is more important than a complete system. I've mostly used IDEA and Eclipse for java development, for most other things my preferred environment is: Emacs, make, Subversion and about 10 terminal windows on a dualhead Linux box. In my spare time I enjoy tinkering with electronics, as described on my website <http://dren.dk>, I'm involved in volunteer work at the annual Scene Event computer arts festival <http://sceneEvent.dk> and I'm a card-carrying member of the danish beer appreciation society <http://ale.dk> (Danske Øl Entusiaster). 1994 HTX (electronics line) Randers Tekniske gymnasium. 1996-Now Zepo, used by The Gathering, Assembly, SE, DH and others. 1998 5. Sem. Proj. Zepo for KANDU, The Gathering Norway. 2003.12.01-Now Release Manager and Developer at Stibo Systems. "Datamatiker" has no direct translation to english, but according to Aalborg University the closest translation is computer scientist. Datamatiker is a 2.5 year education focused more on practical development than a traditional BS (less theoretical math, but more accouting/business related studies). In purely english terms Datamatiker could be said to be somewhere between a BA and a BS of comp. sci.